In plan, a torsion beam suspension is usually shaped like a slightly odd-looking ‘H’. Here is the view looking down on a torsion beam suspension. The green rectangles are the tyres. The purple blocks are pivot points attached to the body and the black lines are the suspension members. The thick blue line is the transverse torsion beam that is welded to each of the trailing arms. 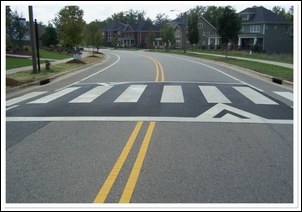 Imagine both wheels pass over a single upwards bump – like a speed hump. Both wheels move upwards as the trailing arms rotate around their forward pivots. As the wheels move upwards, so does the torsion beam that links them. Now imagine that only one wheel passes over an upwards bump - the other wheel just continues rolling long. (For the one-wheel bump think of a brick on the road!) This time only one trailing arm pivots around its forward point as the single wheel rises. But what happens to the torsion beam? 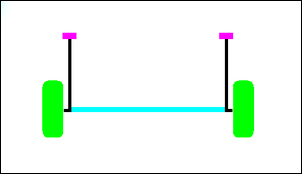 If one wheel rises and the other does not, the torsion beam must bend (to accommodate the different heights to which the trailing arms have risen) and it must also twist (because a turning moment occurs). The torsion beam is able to accommodate these movements because it is appropriately shaped from the correct steel grade to allow it to flex in both bending and torsion. Let’s explore torsion (twist) in more detail. Here we’ve redesigned the suspension, with the torsion beam closer to the pivots. Now over one-wheel bumps the torsion beam twists more than it bends. Now let’s move the torsion bar component down to the axle line. 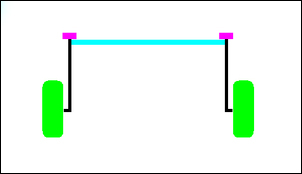 This time, when a single wheel passes over a bump, the beam is subject to more bending than twisting. So the further the beam is positioned away from the pivot points, the greater the bending of the beam that occurs in one-wheel bumps. So what’s this got to do with body roll? First let’s start off with an imaginary suspension design that causes both wheels to always compress the springs by the same amount. So in this design, both back wheels must rise by the same amount, even if only one wheel is passing over a bump. Think about that for a moment and you can see that such a car could not have any body roll! So why couldn’t a car with this suspension have body roll? 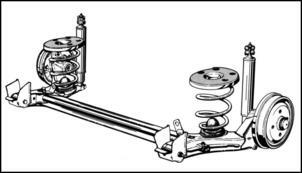 That’s because normally when a car rolls, one spring is compressed and the other is extended – and in this mysterious suspension design, both spring movements are always the same. Therefore, the more than you can configure a suspension system so that the left and right wheels always move up/down by the same amount, the less body roll that will occur when cornering. And that’s just what an anti-roll bar tries to do – connect the action of the springs. Let’s take a look. Anti-roll bars (sometimes called sway or stabiliser bars) reduce body roll. They do this by linking the two sides of the car – either at the front or at the rear. 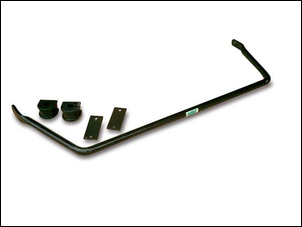 Taking the case of a rear sway bar, the roll of the car is resisted by the torsional (twisting) action of the sway bar that attempts to compress the inside rear spring as much as the outside rear spring. 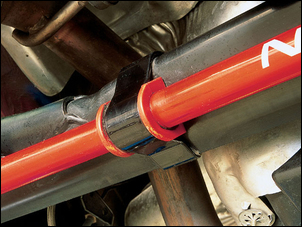 In other words, a sway bar is effectively an extra torsional spring that connects the left and right wheels together – in this case, at the back of the car. So let’s get back to the torsion beam rear axle design. In this design the beam acts like a torsion bar. In other words, with torsion beam rear suspension designs, the anti-roll bar is built right in! If the torsion bar was mega-strong in torsion, both rear wheels would always rise and fall together – therefore there’d be no body roll. But the reason that the torsion beam is designed to allow some twist is the same reason that you don’t fit too strong an anti-roll bar to other suspension designs – the stiffer the anti-roll, the less independent the suspension becomes. So in a torsion beam suspension, the torsion beam acts like an anti-roll bar – and the closer it is positioned to the pivots, the more torsion it undergoes and so the greater the influence it has on resisting roll. In most cases, the torsion beam is made from an open ‘U’ or ‘V’ section of rolled steel, with the opening facing the front or back of the car. Such a design has little torsional stiffness – although since these beams are made from thick gauge material, they still provide some torsional resistance. Why Increase the Anti-Roll Bar Rate? Anti-roll bars can make an enormous improvement to how a car handles. Purists will suggest that anti-roll bar tweaking should be the last step in a handling package that includes upgraded springs, dampers (shocks), bushes, etc - but if you’re on a budget, increasing anti-roll bar stiffness can be an excellent first step. It’s vital to realise that tweaking anti-roll bar stiffness is less about reducing body roll and more about determining which end of the car is handling more of the cornering forces. Take a front-wheel drive that feels like it’s leaning all its cornering weight on the front outside wheel. Get on the power and it understeers (ie the front runs wide). Get off the power and all it does is stop understeering! But by increasing the rear roll stiffness (eg by fitting a bigger rear anti-roll bar) the cornering weight distribution on the front wheels becomes more even, allowing them to better get their power down and so reducing power-understeer. Such an anti-roll bar also makes the back end work harder. Lift-off the throttle and the back can drift into oversteer, giving you throttle control of both understeer (power-on) and oversteer (power-off). So for most front-wheel drives, increasing rear roll stiffness provides an immediate and noticeable improvement in handling balance. Too Stiff in Anti-Roll Bar? 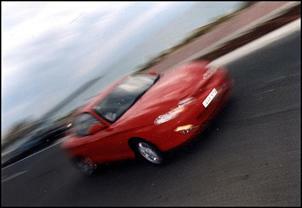 Most manufacturers of front-wheel drive cars keep the rear roll stiffness fairly soft. But if stiff rear sway bars are good for handling, why do they do this? Too stiff a rear bar in a front-wheel drive will result in a much higher likelihood of a spin if you lift-off mid-corner. A soft rear bar also results in plenty of understeer – something which is good for safety in the averagely-driven commuter car. However, if you don’t go to extremes, it’s quite possible to gain better turn-in and much improved mid-corner balance with greater rear roll stiffness. You’ll also find that the car can be much better throttle-steered – back-off the throttle a little and the rear will come out gradually; get back on the power and the car will follow the cornering line. The acid test is cornering on a wet road with a load in the back – you don’t want the rear so stiff that a slight throttle lift will cause the car to spin. But to get this effect in an otherwise standard car, you usually have to make a radical difference to rear roll stiffness. Note that a front-wheel drive with an over-stiff rear sway bar (or more correctly, too high a total rear roll stiffness) will feel great up to 8/10ths – turn-in will be sharp and the car will sit flat. But go that extra step and you can be bitten. In standard cars we’ve only ever experienced this once – but that car could spin literally in its own length.... see the end of New Car Test - Piloting the 1999 Hyundai FX Coupe. We don’t want to frighten you – make the modification with common sense and you’ve nothing to worry about. But there is a reason that 99 per cent of manufacturers don’t go over-stiff with the rear... and it’s something you should know about. Let’s see where we’ve come in the analysis of torsion beam rear suspension systems in front-wheel drives. - In one-wheel bumps and when the car rolls, the torsion beam is subject to bending and torsion. Sometimes an added internal bar is used from the factory to improve the torsional resistance of the beam. 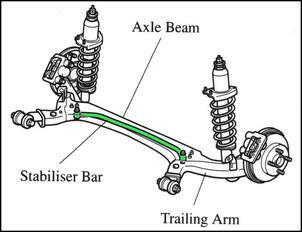 The total torsional resistance of the beam acts as the rear anti-roll bar. - During body roll, the wheel on one side compresses its spring and the wheel on the other side extends its spring. 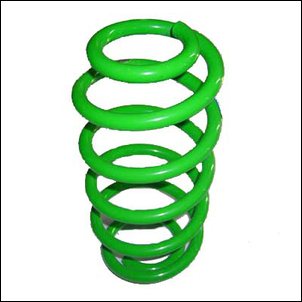 In any suspension system, the more similar that the springs can be made to behave in extension and compression, the less body roll that will occur when cornering. - Reducing body roll by adding a rear anti-roll bar (or by changing the torsional stiffness of the beam) will improve the front/rear cornering balance. However, going too far can have some adverse effects. That’s enough to chew over: next issue we’ll explore the different ways of upgrading rear roll stiffness on FWD cars with rear torsion beam suspension, and show you how with one approach you can achieve a great DIY outcome for under AUD$50!